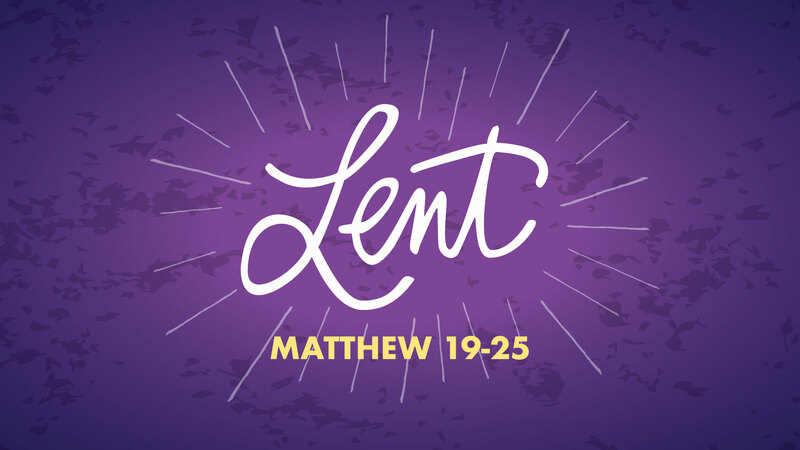 As we continue through Matthew’s Gospel on Sunday mornings during this season of Lent, we will actually be looking in on the final days before the death and resurrection of Christ. Our hope is that this will be a season of individual prayer, fasting, and devotion that serves to posture our hearts together before God with both humility and expectancy. If you aren’t sure how to observe Lent, I would encourage you to take a look at our previous blog that contains some suggested resources. Also, if you’re late to the game, I hope you won’t let that stop you from joining us in observing this season. One church member just shared with me that they adjusted the dates that they would be observing Lent because of some obligations they had coming. That is okay. This isn’t meant to be burdensome it is meant to lead us to remember Jesus who took our burdens. To be a church that prays. To be radically committed to increasingly submit all of life to the empowering presence and Lordship of Jesus Christ. To be radically committed to identifying and reaching outsiders with the good news of Jesus Christ. I’m asking that each person in the Redemption Church family engage in these three things during the season of Lent very intentionally. So, as you fast, carve out time to pray, read the Bible, and spend time in a devotional, here are a few very practical ways to unite with the whole church in this season also. Prayer – As you spend time in prayer during your daily workout, commute, or lunch break, please be sure to pray toward these three goals above. Maybe jot them down on a notecard to put in your Bible as a reminder. What do we learn about God’s character and nature through this story? What stands out to you about the work of God through Jesus? What is our identity as a result of God’s work? Practically, how do we live in light of our new identity? Invite – Identify 1 person you know who doesn’t know Jesus or is unchurched, and invite them to come with you on Sunday and take them to lunch after the service.